Have you ever wanted to have a smart rotator sending traffic to your best path? That's exactly what we're going to do in this tutorial! The best path, is the one giving us the highest revenue per view. 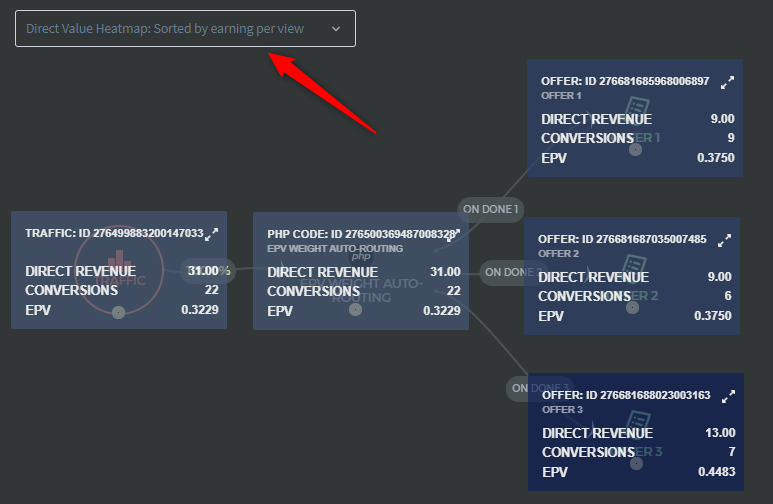 If on average you earn $0.37 for each view of offer 1, while you earn $0.45 for each view of offer 3, you will want to show offer 3 to your visitors more often than offer 1. Granted you have reached statistical significance. In this example, we are only 49% confident that offer 3 will be more profitable than the other offers. What we will do is take this EPv winner rate to automatically split the traffic to these offers. In the example above, since we are about 26% confident that offer 1 and offer 2 will outperform the others, and about 49% confident that offer 3 will be the best performer, we will route 26% of traffic to offer 1, 26% to offer 2 and the rest to offer 3. The more confident FunnelFlux's Bayes calculator is that an offer is going to outperform others, the more percentage of traffic it will send toward it. So here are the steps to put this in place. 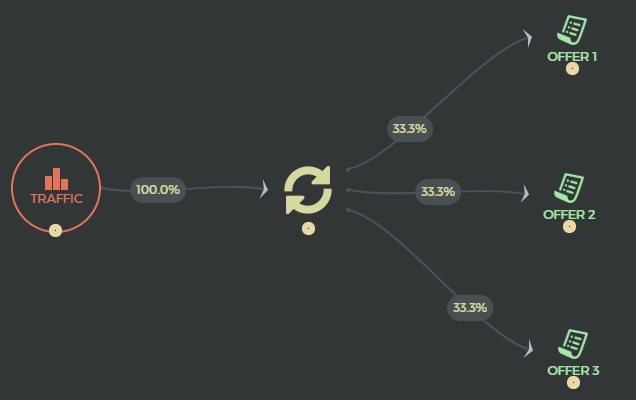 First, you have to split the traffic via a PHP node instead of a regular rotator. 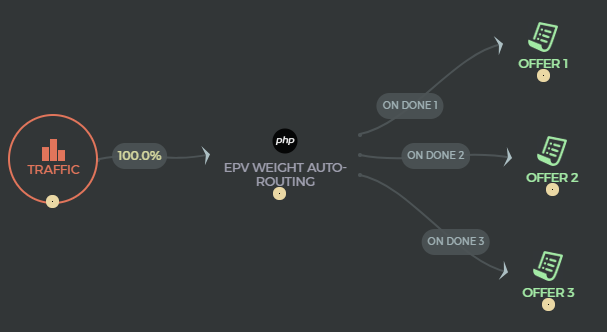 Let's call this PHP Node "EPV Weight Auto-Routing"
The connections going out from this PHP node must be sequential and start with "On Done 1". Do not skip numbers. "On Done 1", then "On Done 3" would not be valid. You can put any node type after this PHP Node, it doesn't have to be only offers. If you want to place landers after, or a mix of node types, it's perfectly fine. It will still be able to calculate the best performing paths. You can alter the segmentation level, i.e. the buckets it optimises within, by changing the JSON payload in the reporting API call used and then cacheKey parameter. You could change this to group by another parameter as well, e.g. Note that the call to the reporting API in the initial code above takes advantage of cached reports, so it's always fast. If some other groupings are added, it may have to load the reports from raw data, which would be slower. Best to check within the FunnelFlux drilldown reports page if the specific grouping combination one wants to optimize for is going to be pulled from raw data or not before changing the JSON payload.